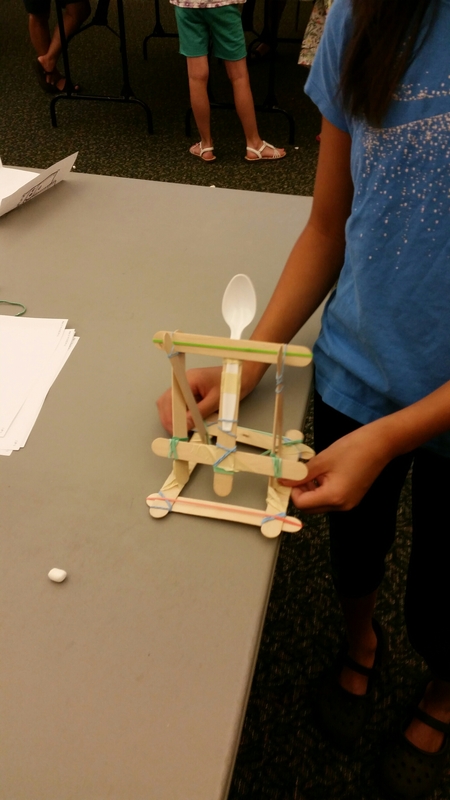 popsicle stick catapults | The Loudest Librarian! 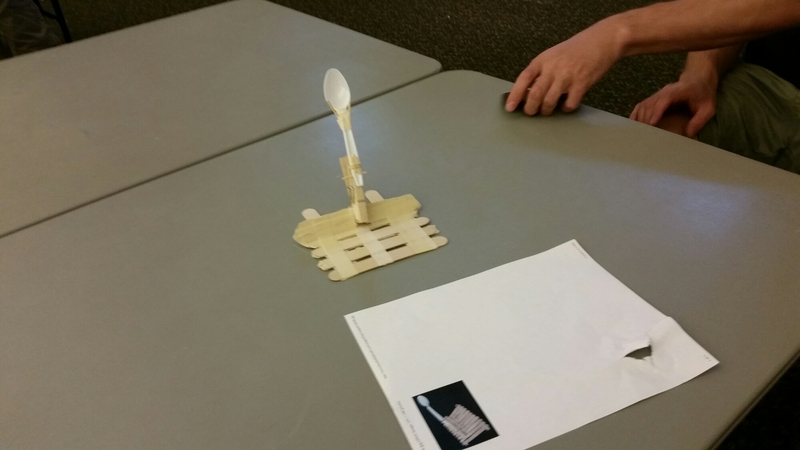 This week’s theme for the Sizzling Science program for grades 5 and 6 at the Burlingame Public Library was Fun with Physics. 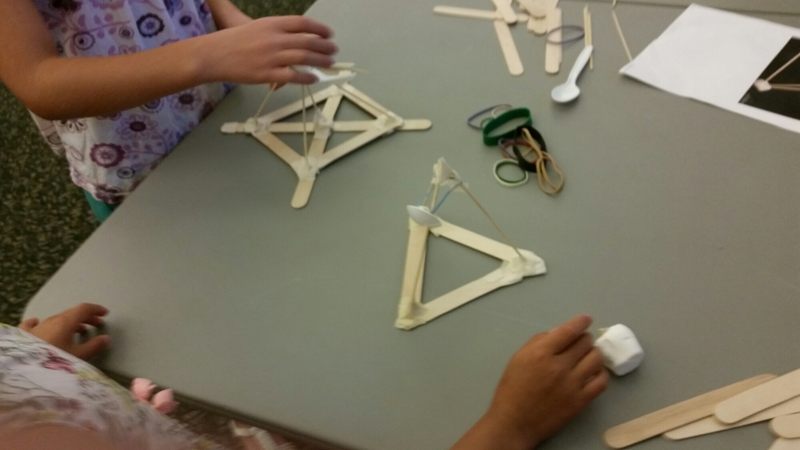 We made marshmallow catapults, and a huge mess, but it was fun! I brought out my kids’ Angry Birds: Knock on Wood Game, which includes a simple plastic catapult for launching a toy bird, and demonstrated it, asking the kids how it worked. We talked about potential energy (the energy stored up when you pull the launcher back), and kinetic energy (the motion energy released when the toy bird flies into the air). We talked about the different things to consider when targeting with a catapult: the amount of tension you apply when you pull the launching arm back, the vertical speed (how high the projectile flies), the horizontal speed (how far it flies), and gravity (how fast it falls). 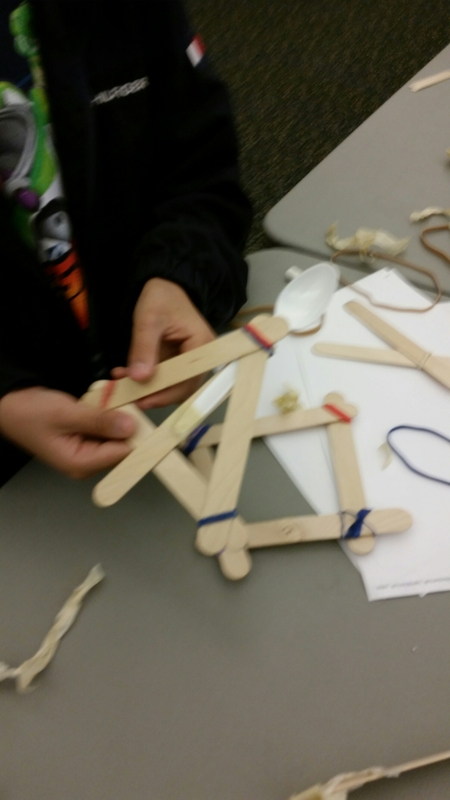 I told the kids that they would be designing and creating their own catapults, and had them break into pairs. 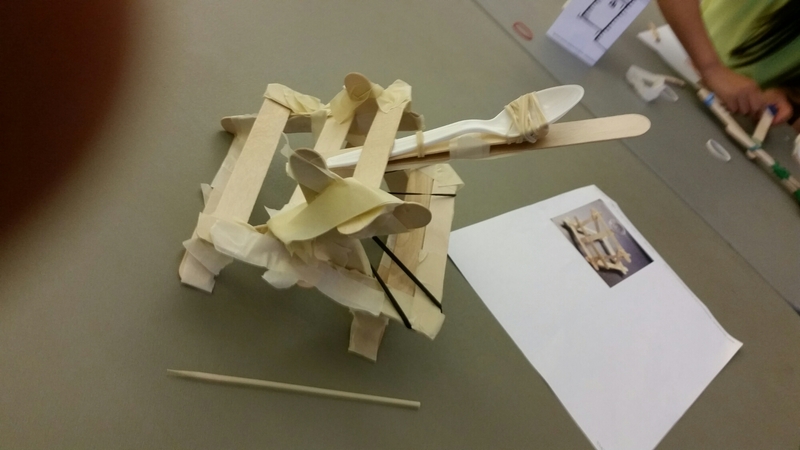 I passed out pictures of different catapult designs, including this one from Z Home Team, this one from DevinCollier.com, and this one from teachengineering.org (I had made a sample of this one, except I used a spoon instead of a popsicle stick with a cup on the end. I gave them a few minutes to discuss what they wanted to make while I set out the supplies. 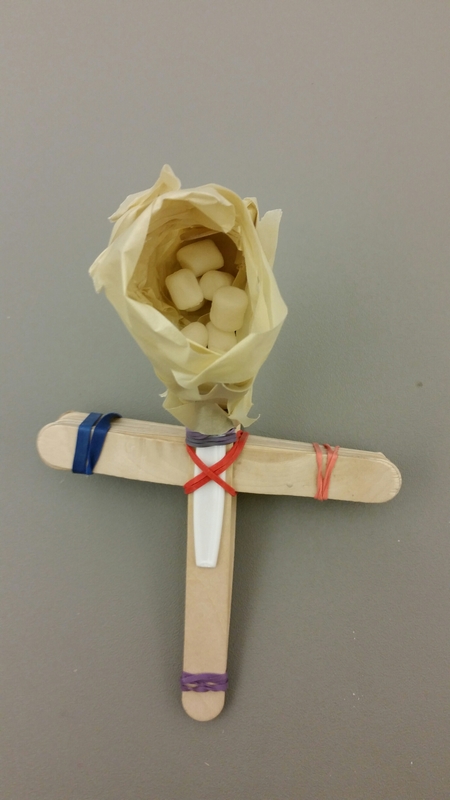 The materials I provided were: small wooden skewers,wooden clothespins, rubber bands (all sizes), large popsicle sticks, masking tape, plastic spoons, marshmallows (mini, regular, and jumbo). I told them they could each make their own catapult, but they could work with their partner to brainstorm and refine their design. Then I set them loose to gather supplies and build. Soon there were marshmallows all over the room, and I had to establish a “non-human targets only” rule. I did put out printouts of a castle, folded into thirds so it could stand up, on each of the tables for the kids to use as a target. Originally, I had imagined them taking turns shooting at the paper castles, to see which catapults were the most accurate and which could shoot the farthest, but they were all engaged in different parts of the design process for the whole hour. In the end, I think that was the biggest takeaway: the experience of testing out a design, refining it or rebuilding it entirely, and testing again. 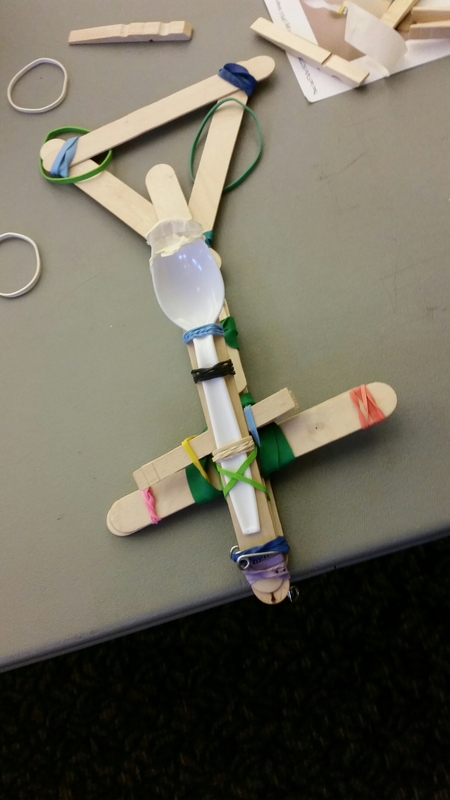 Afterwards, one mom commented that her daughter had taken another class a while ago where they took the kids step-by-step through the process of building the Z Home Team-style catapult, but that she thought it was a lot more fun to let the kids design their own (a big relief to me!). I had actually prepped a whole other project–a balloon launcher–but we never got to it. It’s super simple. You cut the bottom out of a plastic cup (which I had done ahead of time). Then you tie a knot in the end of an uninflated balloon, and cut the bottom out of it. 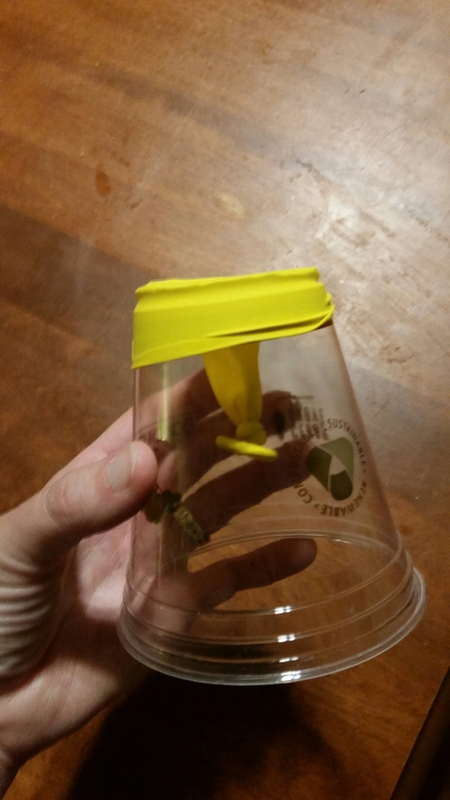 You stick the knot through the hole in the bottom of the cup, then stretch the open bottom of the balloon around the cup’s base. After that, you can put a marshmallow, or some other small object, inside the balloon, stretch the knot back, and let go. It’s very effective! I actually demonstrated to a few of the kids who were still hanging around while I was cleaning up, and they were very impressed. I gave them each a cup and a balloon to take home. I’m still surprised how much I’m enjoying this classes, even though they are different than anything I’ve done before. The kids have so much creative energy and ideas, and it’s amazing to see them in action. Next week’s theme is Electronics. I’ve ordered Brush Bot kits from the Maker Shed, and am thinking of pairing that with a popsicle stick flashlight. Both of those projects are much more defined than this week’s catapult challenge, so I’m curious to see how they go. I’d appreciate any advice anyone has, or other fun, easy electronics projects.